Carly finds out that Bobbie and Lucas are in the hospital. She plans to head out there, even though Sonny needs to tell her about his deal with Ava. Carly is shocked when Ava arrives to pick up Avery. Ava makes a comment about Carly not knowing their plan, so Sonny throws his weight around. He tells Ava to apologize to Carly or she won&apos;t see Avery. Liz brings Spencer home from his sleepover. Laura and Hayden are forced to tell the boy that his father is missing and presumed dead. Hayden mentions that Jason was there. Laura reassures Spencer that Nikolas is a survivor. Spencer wants to find out what the police know. Lulu and Dante discuss buying a house and having another baby. Both of them get the call about Nikolas and head over to Wyndemere. Dante checks with the police, who tell him it&apos;s still a search and rescue mission. Kiki tells Dillon that she had a good time at the Nurses Ball. Dillon mentions the kiss and says that it felt right. Kiki agrees that it&apos;s the best thing to happen to her in a long time. Dillon worries that it&apos;s too soon, but Kiki admits that while she&apos;s rebounding from Morgan, she likes spending time with Dillon. She feels things are uncomplicated, which is what she needs. Sam, Jason, and Diane show up at the PCPD to answer Jordan&apos;s questions. Diane explains about the lawsuit, which prompted Jason to go see Nikolas. Jason explains how things went down. Jordan accuses Jason of pushing Nikolas through the window. Sam explains how she got there shortly after Jason and heard the window break. Jordan shows them the surveillance video, which shows Nikolas arriving at 12:02 am, Jason at 12:28 am, and Sam at 12:35 am. The timeline leaves 7 minutes for Jason to scuffle with Nikolas and throw him out the window. 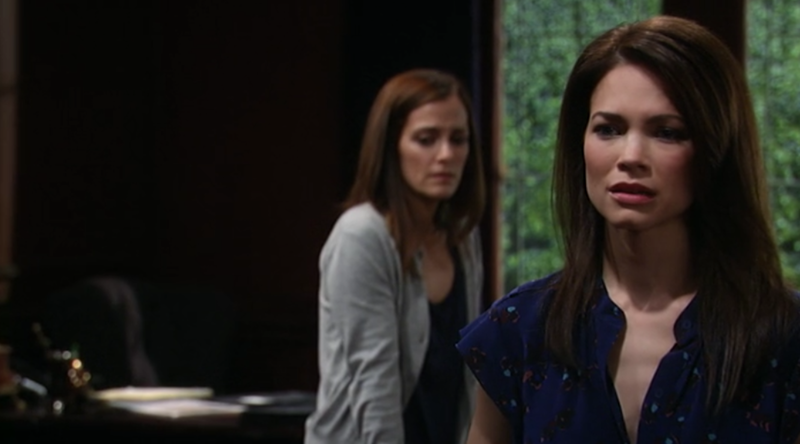 Liz accuses Hayden of killing Nikolas and pinning it on Jason. Hayden points out that she couldn&apos;t have pushed him out of a window even if she had wanted to. Hayden mentions her alibi. Liz says she warned Nikolas about Hayden. Hayden counters that Liz just wants to save Nikolas and Jason. Liz feels Hayden is responsible and will pay. Sonny wants Ava to be civil to Carly, so Ava apologizes and says she wants peace for Avery&apos;s sake. Carly brings Avery to her and they leave. Carly is royally pissed at Sonny. Sonny claims they made a mistake with Michael and AJ and this way, they can neutralize Ava&apos;s influence on Avery. Jason wonders how much trouble he is in. Diane says his previous altercations with Nikolas will come into play and worries about his arrest. Liz shows up at the police station and tells Jordan she has information on Hayden and Nikolas. Sam worries about a trial, but Jason says he&apos;s leaving.